An orthotic is a corrective medical support worn inside a shoe, to support, align, prevent and accommodate foot deformities and improve the function or foot. They are prescribed medical devices to correct biomechanical foot issues for example problems with how you walk, stand, or run. When appropriately prescribed to treat a medical condition and custom-made for you, orthotics can decrease pain, not only in your feet, but more commonly in other parts of the body, such as your knees, hips and lower back. They work in a similar way to braces on your teeth, by gently exerting pressure on your feet to bring them back into proper alignment. 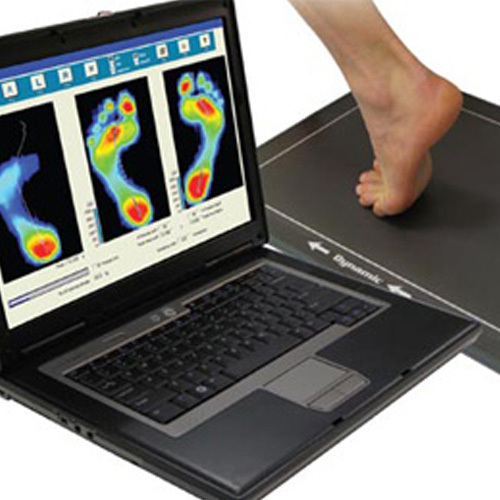 A state of the art computerised gait scan, which provides a comprehensive biomechanical evaluation for each patient. This evaluates many important aspects of how you walk, bear weight and transfer pressure through your feet to assist in effective diagnosis and prescription of orthotics where necessary. Once you have been evaluated and diagnosed your scan is sent to the laboratory along with your diagnosis so that your custom made orthotics can be manufactured and this will take approx. 2-3 weeks. Railway road, Gorey, Co. Wexford, Ireland. © Gorey Family Chiropractic Clinic 2019, All Rights Reserved.